Privately set back on 1.45 acres you'll find this stunning renovated 5000+/- sq. 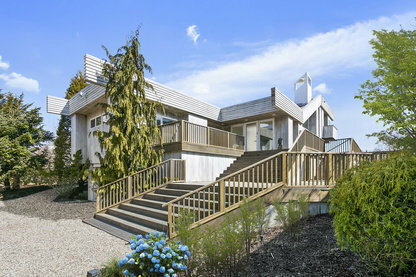 ft. contemporary waterfront masterpiece in the desired Westhampton Beach. This meticulously landscaped canal-front has a waterfront pool, har-tru tennis, 165' of new bulkheading, floating dock, koi pond, and canal-front patio. Enjoy the waterviews and pool from the mahogany deck and take a break from the sun in the cabana/pool house which also has two bedrooms and a bath. With walls of glass and high ceilings, embrace the sunny southern exposure this home offers. The first floor boasts a light-filled open floor plan with cathedral ceilings, living room with fireplace, dining room, & kitchen with two dishwashers and sinks, state-of-the-art appliances, butler's pantry, and unobstructed canal views. Additionally, you'll find a media room, extensive wine cellar, teak flooring, hurricane upgraded windows and doors, smart system, flo-logic water protection, new boiler, (with 5 zone A/C and heating), newly surfaced roof, and a generator. Don't forget the 2 car tandem-park garage!